“What has happened in Genoa is a huge shock. Not only for Genoa, but also for Italy and the profession of civil engineering. Was that bridge, in sum, too vulnerable? (…) Pinksummer has two artists who work with balloons. One’s background is Peter Cook (Archigram) teaching and the other one moves from a project started with Gordon Matta-Clark. (…) What now can be done? Can’t Peter Fend with your gallery help? The other people copied in have been involved in the balloon-bridge idea, or Matta-Clark, so that the reason; this could be solely Pinksummer effort. No? Peter Fend wrote us in an e-mail last 15 August 2018, cc’ing a lot of unknown people. But that’s usual for Fend, it’s a part of his geography “across the borders”. We could say that the exhibition Filling the Absence with Peter Fend and Yona Friedman, curated by Andrea Canziani and Emanuele Piccardo with a film-documentary co-produced by Museo Nivola and Pinksummer, curated by Elisa R. Linn and Lennart Wolff, was not originally chosen by the gallery, as we actually just agreed on different inputs tending to overestimate us and we felt like having them vibrating from us and with us. As soon as we came back to the gallery after the summer break, in the first days of September, Emanuele Piccardo and Andrea Canziani came to us, quoting the example of the gallerist Max Prototech who, after the collapse of the Twin Towers, invited more than 100 architects and designers to present proposals for the development of the site, then denominated Ground Zero. At the beginning of 2002 Protetch, in collaboration with Architectural Record editors, organized the exhibition New York, a New World Trade Center: Design Proposals, where 60 proposals were presented. Piccardo and Canziani stated that we should have started from the collapse of the bridge on the Polcevera described as “the narrow concrete belt that goes through the green valley, paradigm of post-war modern Genoa” to regenerate the future of a fragile city, tending to become more and more fragile, because of the lack of infrastructures but even more because of the lack of a prospective vision. Piccardo and Canziani proposed to organize an exhibition. Joseph Grima suggested the open call. After a series of confrontations with Piccardo and Canziani, we decided to invite Yona Friedman and Peter Fend, that in their difference are indeed very similar, both being “programmatically utopic” and also because of their distinguishing generosity, meant as an anti-monumental attitude, avid of life, of movement and of fresh and positive dissatisfaction. Yona Friedman influenced two generation of architects by working with drawings, collages, models, ideas and theories, books, movies. In his text Biosphere is still common property except for land use he writes: “The concept of land property started by focusing on land area in a 2-dimensional way and developed later into 3-dimensional interpretation. Land-ownership was extended “reach the sky”, including water surfaces, like “territorial waters”. The biosphere become owned property. Luckily enough, ownership was not extended to the atmosphere, to air, to rain, to sunshine. The essential of my proposal of “cloud infracstructure” is based on those new technologies which are indipendent of direct land use, like solar plates, compact batteries, rain collectors, information clouds. Cloud infracstructure has no owners”. Peter Fend, without hiding any sense of frustration which became a principle of his work, gave his vision to the re-mapping of the real-world actions, moving from geographical representation and from lucid reading and without prejudice of History, capable of moving a linear segmentation of cause and effect, inside a prospective in which the relation of ideas expresses the a-priori and a-posteriori in a circular form. His book Ocean Earth is emblematic in this sense. Beyond Mega-Structuralism and modular assemblage language, which Fend perceives, he confessed, as a mountain to climb, when he came back from his first meeting with Yona Friedman in Paris, held last November the architect’s studio, that happened regardless of us and without us even knowing, for a curious coincidence that we will tell later, Fend told us that Friedman is the first person he met in the architecture world, who deeply knows physiocracy, an economical doctrine formulated from the physics François Quesnay in the Eighteenth century, and he stated: “On that, we two may be fairly unique in the architecture community, or even the art world” and yet “Physiocracy was invented by the physician to the French King. He concluded that the well-being of the Nation, of its people, rested on a foundation of the well-being of Nature. The animals and plants had to be healthy. The word “ecology” was not used then, in the early 18th century. But the physician understood the obligation of the State, or the King, to assure that people could be healthy. This mean, the land and waters must be healthy. Indeed: people come and go; how is the land and water? No tyranny is worse than that of having to try living in a polluted, unhealthful environment. There is no escape”. 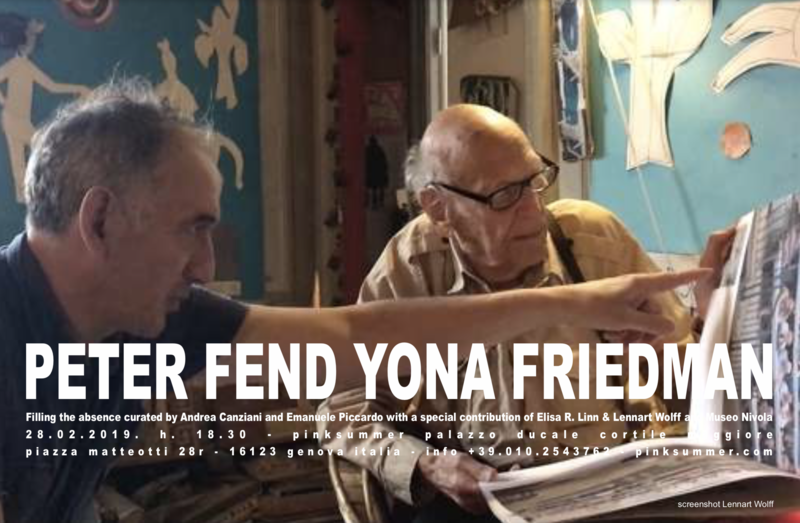 Peter’s trip to Paris for meeting with Yona Friedman was organized by Nivola museum, to which Elisa R. Linn and Lennart Wolff proposed the project of a collaboration between Friedman and Fend since 2017; the exhibition will open next October 2019. We got to know about the project from an e-mail by Lennart Wolff in December. Peter Fend and Yona Friedman, both “transcendently” above that apparent conflict of interests, never mentioned their collaboration project in Sardinia. The movie-documentary curated by Elisa R. Linn and Lennart Wolff and coproduced from Nivola museum and Pinksummer, was born from a syntonic coincidence, transformed by an opportunity, moving from material collected by Wolff during Yona Friedman and Peter Fend meeting in Paris. The open call, March 15th its deadline, with the intention presented below, works on the hermeneutics of the absence, from any point of view we want to consider it. In an uncertain Italian debate as if safety of a possible identity was subjected to the closing or opening of the ports, in spite of the fact that a port itself indicates a safe docking, here in Genoa what happened after the “collapse of the bridge” more than reminding of the collaboration between Traian and Apollodorus of Damascus, who in 105 a.C. built a 1,1 km long bridge, as long as the motorway viaduct on Polcevera river, designed by Riccardo Morandi for the Italian Society of Water Channels and finished in 1967, recalls the contemporary neo-feudalism, allergic to any idea of participation, that, justified by the emergency (state of exception), ended up ignoring the rules of competition for construction, meant as a fully democratic premise. Pinksummer: Democracy is people government through representatives freely elected by citizens with the right to vote. You said that in a democratic government the parliament shouldn’t be expressed by the majority of those who voted but all those who are registered to vote and, therefore, the abstentionists as well. The percentage should correspond to those elected in the same way of the Assize Court. Lenin intended the abstention as a tactic and strategic form compared to the coherence of the revolutionary ideals, is abstentionism a form of resistance for you? Yona Friedman: Abstention is a party. It can be represented by randomly chosen delegates, as jurors to assizes are chosen. Ps: Is the web, internet, in any form, always a theatralization of already known contents compared to information? YF: Internet spreads often fake information. So do all media. Best is easier to fight them via internet, but not necessarily more efficient. Ps: What do you mean when you say that migrations are a defense for people against iniquity, as well as instruments of social regulation? Does migration represent a threat for the democratic State or just for the mafia? YF: Migration is “voting by one’s feet”. I myself migrated three times, leaving behind political situations that I did not like. Ps: Once you stated you would like to lead Italy on the way to build railroads in the Sahara Desert in Africa, not very differently to what China did, in line on what Matta-Clark said (or wrote): “The only thing I believe in is railroads”. The idea is to substitute the politic of humanitarian aid with investments that bring to a true cooperation. In the last 10 years China built 2233 km of railroads in Africa and is building others. The president Xi Jimping during China-Africa Cooperation Forum launched a new industrial plan for agriculture and clean energies. Actually, it deals with oil in exchange of streets and railroads and the Chinese humanitarian aid in Africa were only declared. Isn’t it just neo-colonialism or better, in the case of the Empire, neo-imperialism? Talk about Eurafrica you have in your mind. Peter Fend: Genoa is the port of Milan-Torino-Parma-Genoa, and more, much as Rotterdam is the port of Amsterdam-Utrecht-The Hague-Rotterdam. Every major airport has a hinterland. and the global hubs of Qatar, Dubai and Istanbul, made possible by their location amidst world travel and by petroleum. More importantly, Genoa can become the main port for Europe with Africa–bigger than Marseille. This requires one or two rail lines across the Sahara to sub-Sahara Africa. Italy started a trans-Sahara RR several times, first in 1871, China builds rail roads on such a scale, across much bigger deserts, in these years. Can Italy compete? Ps: Starting from the Morandi bridge, your idea of reconstruction always recalls large scale, and you always mean a strategic infrastructural system, without forgetting the environment. You studied Genoa and its territory. Genoa is essentially a port, and ports need streets, and efficient railroads. Why did local administrators and central government let Genoa port being forgot and the city isolated thanks to motorways and inadequate ferries to travel in a speeded-up time? Since ‘80s the environmentalist and the residents of the north of Genoa, interested to the so called “Gronda”, opposed calling the Tar. How is it possible to combine the needs of the environment to the fact of giving breath to north, to a port and to a city in a difficult territory that implies natural erosions, expropriation and destruction of artifacts? You said the only possibility for Genoa is to become the port of Milan. F.: Birds flying from the jungle in Africa to the tundra in the Arctic, and back, pass through Europe. These birds are essential to the Northern Hemisphere ecosystems of these longitudes. They function to distribute nutrients and seeds throughout the longitudes. But such flights are declining. There are many causes. Almost all of them are human. Why, for example, have insect populations declined by 75% in the past 25 years? Without insects in great number, there cannot be enough birds. China has adopted a massive campaign of building infrastructure, and organizing human populations, along paths largely from Far East to West, across the whole of Eurasia. This campaign extends around the world, to all of Africa and all of Latin America. Italy is caught up in the overall plan, as a minor underling. What can Italy do in response? Italy can mount a campaign of similar scale and concept, but along paths from sub-Sahara Africa across the Sahara, north to Europe and the Arctic, and back. Italy can do this with other countries in both Africa and Europe. Mimicking the bird flyways, Italy can lead in the construction of rail lines across the Sahara. It started this in 1871…. Team up with African and European countries to follow through. The distances across desert are less than those crossed in recent years by China. And along all the paths, Italy can pioneer the construction of marshes, oases, feeding grounds for animals, and revived salt lakes. It can do this not only in Africa but also in the Far North of Europe. The Arctic is melting these days; the ecosystems are burgeoning with life, especially in summer; why not work along the shores of the Arctic, all around? Why not follow through on what Umberto Nobile, the Italian duke, pioneered in the 1920s, a hundred years ago: the first crossing by balloon of the Arctic Ocean. Did Nobile do that just as a lark? No, he did so because he knew that Italy should be active in the Arctic. This can happen now. All the coastal waters for action in the Arctic are on display this week in Kirkenes, on the border of Norway with Russia. A film-maker and I intend to go to those same waters this summer, to challenge the oil industry in its scenario for drilling and to find out, on many sites, if seaweed can be harvested instead to yield no-emissions biofuel. Such research could be furthered by ENI. It could be started right now in ENI holdings off a main outflow from the Arctic, the Labrador Current. Many actions have been charted and planned for the coasts of Africa, and even for well inland. These should best be started during the winter. Schemes could be mapped out and launched from Italy. The urgency of action in the Arctic is clear: seaweed proliferates during summer, due to tundra melt and sharp rises in temperature; the seaweed helps reverse acidification of the world ocean; meantime, oil companies of the Great Powers (Russia, China, US, UK, but not–significantly, France) work to drill for fossil oil and gas, at huge cost and risk, with serious danger to the Arctic as anything alive. The urgency of action in Africa is also clear: the continent will have 2 billion people by 2050, assuming no catastrophic war, but, well, questionable, since Africa does not now have enough suitable water. There could be famine. There could be more drought. There could be massive die-offs. There could be more violence and terror. What is to be done? Economic activity with benefits to ecology, in restoring water cycles, must begin. Furthermore, they must be led by countries such as Italy. Otherwise, only China will be doing all the deeds. China is already well on the way to becoming the dominant power in Africa. That is not good for Italy, or Europe, or maybe also Africa. Italy needs to enter the African world as much as China already has. Shall hundreds of millions of would-be refugees from Africa be flooding Europe? And shall Africa remain a continent mostly of deserts? With weak flyways, ever less benefiting the countries, like Italy, to the north? Genoa can be a center of decision. Genoa, together with Sarzana, Savona and potential rail hubs to the north, like Ovada or Tortona, can assert that it will coordinate in a region to become a major PORT in the exchange of Europe with Africa. It can call itself PORTA AFRICA. Genoa can do all this in concurrence with China, and on the same scale of global infrastructural thinking as China does. Genoa can also talk with Mercitalia, the freight division of the Ferrovie dello Stato, to construct railroads from Europe north to the Arctic, in collaboration with Norway and Finland, and it can talk with Mercitalia about building up both ecosystems and freight-line routes across Africa. Coordination can be conducted with Japan: both Italy and Japan are world unique in having railroads around the entire coast; both countries are able to build up sea-land economies. Pressure from China, coalesced with pressure from an ever-expanding Turkey, must be met on a similar scale. Otherwise, Italy becomes economically weaker, with Genoa as an early victim. Responding to the pressure thus, in concert with the government in Rome, can restore Genoa as a primary port for industrial Europe, stretching from France to Russia. To do this is not so difficult: Genoa must remind Torino, Milano and the urban-agricultural corridor from Piacenza to Bologna, they their port is, almost always, Genoa. Ps: The viaduct on Polcevera, collapsed last 13 August, was built by Riccardo Morandi between 1963 and 1967, during the period of economic miracle post-WWII, symbol of a dirigiste modernity, that didn’t care about anyone and for sure didn’t think about who was living and kept living in the houses of Walter Fillak street until the collapse of the concrete tape. To quote Robert Smithson, wasn’t Morandi bridge a backwards ruin? Andrea Canziani and Emanuele Piccardo: Smithson in his A Tour of Monument of Passaic in New Jersey in that same 1967, walks along the river and tells with pictures stories of “ruins” which are pipeline, piers, pedestrian bridges, places where the kids can play. Smithson works om the concept of ruin inverting the classic idea of monument, that’s why he wonders if Passaic could be an eternal city as Rome, without having to derive from a monumental will. “Fate wanted that the pictures were of A12 highway viaduct close to Rapallo, images that I used in the project of the philosopher Matthieu Duperrex, who, in 2017, asked to several researchers to homage Smithson’s tour after 50 years” (EP). This is the viaduct on Polcevera: an upside-down monument, it could have been a ruin just if it could have let perceive the existence of time, which is not just the years passing by. But all of this is denied by the will to remove what is timeless to be just ruins. It would be wrong to read that project and those choices with the sensitivity, even environmental, that we have today. Modernity of post-WWII didn’t have antidemocratic connotations, of course had capitalistic and technocratic connotations. But it was, at that time, a William Henri Smith technocracy: at the service of industrial democracy, with an ethical and moral goal of another importance compared to the next capitalistic drift. Morandi’s project has nothing dirigiste, it doesn’t change the city in which it fits, it doesn’t ask anything, it responds to the purpose of linking two highways. It does it so well that immediately it has been recognized as a formal example of a big interest, even landscaping, in the engineering environment of that time. It’s important to contextualize Morandi’s project with the economic boom and the wish of growth of Italy, modernist utopia and necessity to have efficient links, the same years of construction of the Sopraelevata (1964). At the same time, we have to contextualize the operation we are doing by this exhibition, which is not a proposal of alternative projects, but of alternative visions. Ps: Did the evolution of democracy, in architecture as well, eroded hierarchies? Is post-modernity mobile and fluctuant or is it just discursive growth? Wasn’t res publica killed by the end of modern homo politicus and by the advent of homo psycologicus, vulnerable and uncertain, looking for his well-being inside a misunderstanding emotive post-modernity? A.C. e E.P. : Architecture has a social and ethic dimension. The project always represents the possibility to live in better conditions. This represents an ideal for a lot of architects, not everyone. Some of them just answer quietly to inhabitants who usually distrust architecture and contemporary times. The weakness of architecture and the crisis of democratic participation mechanisms is well expressed by the situation of the collapse of the viaduct. We assisted to an autoreferential decision-making from the latest commissioner for the latest emergency. The exceptional state justifies everything, and politic propaganda reassures, hypnotizes, anesthetizes, through an offer of total delegation to the government politic: everything will go back to normal, don’t worry. How many freedoms are we ready to abandon to have a reassuring predictability to act in the every-day life?It wasn’t postmodernity – assuming it ever existed – nor the hypermodernity we are living in, that impose what’s happening. Maybe we can find a hint in the autoreferentiality and in the selfish leadership of homo psycologicus, but it seems more reasonable that widespread arrogance and ignorance contribute to define contemporary society as a Society of spectacle of Debordian memory. Here’s the importance of activating mechanisms as the ones that generated this exhibition and the connected open call to Yona Friedman’s and Peter Fend’s work. As the political agenda can be dictated by emotions and not by rationality, but under no circumstances we want architecture to become its silent handmaid. Ps: You are working at an exhibition featuring Peter Fend and Yona Friedman at Museo Nivola since 2017 that will open next October. Without knowing about each other work we combined the two for different reasons: ours more specific, carried by something exceptional that happened, yours, on the other side, something that could be defined a long term one. What brought you to combine in an exhibition the large/small scale artist Peter Fend and the architect of the ville spatiale, of cloud infrastructures and realizable utopias? Lennart Wolff and Elisa R. Linn: What was an initial point for us to think about bringing together Peter Fend and Yona Friedman was a similarity we saw in their position in relation to the history and discourses of the disciplines of art and architecture. Both have maintained a somewhat peripheral and critical position moving beyond the common outputs, platforms, and institutions: for instance, a museum and market focused art production in the 1980s or the subsumption of modernist ideals by corporate culture and conventional building industries in the 1950s. Doing so they introduced new ideas and possible forms of agency that dwelled on collaboration and exceeded the limits of their disciplines that have proven to be highly influential not only on their contemporaries but also to following generations. Furthermore, in the light of the ever-accelerating unfolding of the climate crisis we were interested in bringing to focus the work of two practitioners that had a pioneering role in finding different ways to consider environmentalist concerns in art and architecture.